With the global population rising rapidly and expected to reach 9.7bn by 2050, governments around the world are increasingly asking the simple but critical question: how will we feed ourselves in future? 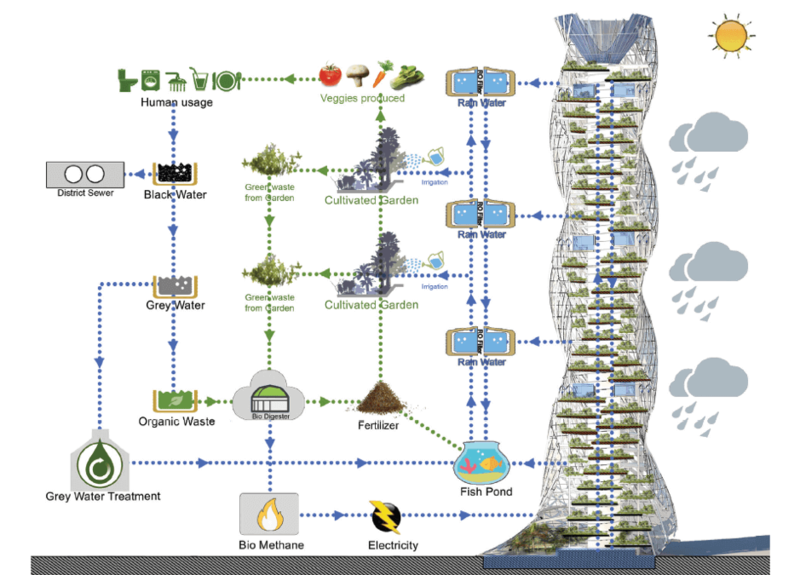 The radical Food Tower vertical urban farming model could provide an answer. Food, it seems, is all around us. In our homes; on our televisions; in our shops; on our streets. Yet, surprising though it may seem given this apparent proliferation, the question of how we continue to feed ourselves in future is set to become one of the biggest challenges facing the developed and developing world. The combined impact of population growth, climate change and urbanisation, which in 30 years’ time could see some 70% of the global population living in cities, means that we are running out of available space and resources to grow crops in traditional ways. In short, we need to come up with new ways to farm; new ways to manage food production and delivery; new ways to reduce pressure on resources and sustain our environment and lifestyles. The food production challenge is already seen in cities such as Singapore. With almost no arable land, Singapore is heavily dependent on food imports and faces a potential food security problem. While past investment has enabled water self-sufficiency to be achieved, the need for a sustainable locally-grown supply of food is now becoming more important. The built environment designers must now adopt a radically different approach to city planning to include food production within their thinking. Enter the radical Food Tower vertical urban farming concept as an innovative solution to these challenges. While Singapore may not have vast land area, it is blessed with an abundance of sunshine and rainfall. The Food Tower concept attempts to maximise this natural potential, and by stacking vegetable growing areas in an open, sunlight flooded high rise towers, sunlight can be captured boosting growing yields across the 1 hectare site to some 400 times that of traditional farming. The Food tower concept takes a major step forward in large scale urban farming by using Aquaponics; vegetables are grown on towers using the water and nutrients from a system of tanks in which Red Talipa fish are reared. The vegetable towers are located on “wings” on higher floors that spiralling upwards to maximise sunlight exposure; the fish farms are located at the lower floors where there is more shade. The Food Tower also features a closed loop energy system, with onsite photovoltaics generating power, rainwater harvesting to collect water and wetland reed beds to purify and recycle waste water on site. The wetlands act as part of a garden for the larger community. It is estimated that a 100 storey food tower on a 1 hectare of land can provide sufficient meat and vegetables for just over 11,000 people per year. While the technology and design for high-rise farming in cities has been slowly maturing, there are a number of other factors which need to be addressed early so that Singapore can stay ahead of the curve and be ready to capitalise on the technology when it becomes viable. This starts with the physical planning and zoning of suitable sites for urban farms, in particular, to ensure that the immediate setback of buildings around the site enables sunlight to reach the crops. Government agencies must be armed with well researched and clear policies, to ensure that this need is well understood and taken into account, and the tenure offered to the farmer or farming community for the land use must take into consideration the efforts put in to develop the farm. Clearly, despite the predictability of the weather in Singapore, the availability of sunlight varies around and throughout the Tower. This must be matched to different types of crops to maximise yield. Land use zoning could designate that certain heights be developed as farms while lower floors are used for other commercial and retail use. Yield per square meter would also need to be mandated to encourage developers to adopt best technology to maximise the efficiency of land use. For example, natural sunlight could be supplemented by artificial LED growing lights, powered by stored photovoltaic energy from panels on the structure – possibly creating 24 hour a day growing conditions in the tower and so maximising growing efficiency. Creating a sustainable solution also means working with the community. Commercial farming revenue from towers could be supplemented by sharing the poorer growing space with other community and residential facilities. These might include an environmental research centre, restaurant and a school plus other facilities such as Community Parks and wetlands to boost interaction with the local community. A new way of farming will need us to create a new breed of farmer; an urban-agriculturist. It is a role that currently does not exist, requiring knowledge of technology and the specific techniques needed to adapt modern intensive farming practice to a high-rise urban environment. The farm workforce would also need a multitude of new skills to run the urban farm; understanding the internal drainage, water and electrical needs of a modern building, the external environment such as solar effects, winds flows plus the impact of dust and city pollutants on crops. In the factory environment of a Food Tower, they would need to be thoroughly grounded in managing work flow and production process while also understanding and managing resource use and recycling of water, waste and energy so as to maximise productivity and output. It is clear we must look globally at more sustainable ways of living. This means including food production in future planning policies as we define and design the increasingly urban, increasingly congested cities of the future. Although the idea sets out to rethink mass food production, it also demonstrates that consumers can be supplied with fresher and safer food with a lower overall carbon footprint. The project has already shown that it has a viable commercial business model but it is also a model that can rejuvenate urban sites, engage the community in various levels and create local jobs. However, the development of such projects will require major commitment and intervention by governments to cover the substantial start-up cost and to create the necessary governance to allow such high-density food production in urban areas.